Two Temples II, Variation Broseley pattern, reversed. The butterfly border is printed on the rim and pedestal base. The opposite side of the cup is printed in the Two Temples II, Variation Broseley pattern, reversed. Note the spelling of the words "wider", "would", "hold", and "cider". 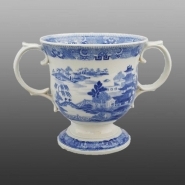 A rare commemorative pearlware loving cup printed and painted underglaze in blue. 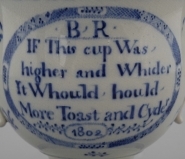 On one side is a hand painted rhyme along with the initials "BR" and the date "1802" framed with a border of geometric design which is, in turn, surrounded with floral sprays (see a close-up of the rhyme below). Printed on the other side is the Two Temples II, Variation Broseley pattern, reversed. The butterfly border is printed on the rim and pedestal base.